Builder of the year John Willis Homes is pleased to announce Beech Creek Preserve located in Athens Georgia in Five Points. Nestled along the Oconee River, Beech Creek Preserve offers 16 custom homesites ranging in size form ½ acres to 2½ acres with over 15 acres of green space. Residents will enjoy the riverfront walking trails that gracefully wind along the banks of the Oconee River and the convenience of Five Points’ upscale dining, quaint shops, and spa, athletic, and medical services. 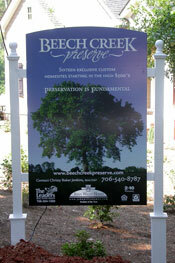 Beech Creek Preserve is moments away from the University of Georgia and downtown Athens and truly offers the homeowner the opportunity to live in the heart of a thriving urban environment while enjoying the peace and tranquility of living on a protected preserve. John Willis Homes brings to this project a unique perspective gained from years of experience creating award-winning communities in Atlanta, Georgia, and more recently in Watercolor, Florida. The homes in Beech Creek Preserve will offer homeowners the finest in both interior and exterior finishes, unique floorplans, and an unparalleled balance between urbanism and serenity. It is the goal of John Willis Homes to create 16 distinctive homes that encapsulate the magnificent riverfront setting and provide an environment both within and outside the home where the homeowner truly feels as though they are living in an oasis. Beloved University of Georgia professor and renowned “father of modern ecology,” Dr. Eugene Odum passed away in 2002 and ended a career at the University of Georgia that began in 1940. 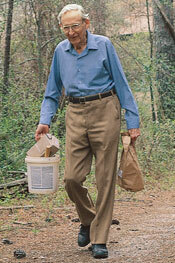 Dr. Odum founded the University's Institute of Ecology in 1961. Raised in Chapel Hill, North Carolina surrounded by lush forests and nature, Dr. Odum developed an interest which led to a passion for today’s modern ecology. His textbook, Fundamentals of Ecology, published in 1953, was the catalyst that introduced and promoted the study of ecology around the world. For ten years Fundamentals of Ecology was the only textbook in the field of ecology. It was translated into many languages and was crucial in the training of an entire generation of ecologists. Former President Jimmy Carter said, “The work of Dr. Odum changed the way we look at the natural world and our place in it.” Odum's influence went far beyond the world of academe. He gave a scientific underpinning to the environmental movement that emerged in the United States in the 1960s and 1970s. Odum was also responsible for the establishment in 1954 of the University of Georgia’s Marine Institute on Sapelo Island, off the coast of Georgia in 1954. With a vested interest in the success of ecological programs at the University of Georgia and the Classic City, he left Athens, Georgia with more than just a legacy of holistic ecology. Dr. Odum endearingly bequeathed over 25 acres of private property adjacent to the Middle Oconee River – the sale ultimately benefiting the ecology department. His will stipulated that profits from the sale of the land would go to the Eugene and William Odum Ecology Fund, after $1 million was set aside for a professorial chair at UGA in Dr. Odum’s name. With Dr. Odum’s stipulations of strict developmental guidelines at the forefront of the development process, The University of Georgia Foundation worked diligently in tandem with the Oconee River Land Trust to honor Dr. Odum’s wish for an environmentally friendly development and agreed to a perpetual conservation easement for the land in late 2004. Assuring that 57% of the parcel would remain protected greenspace, the property was sold to Atlanta-based John Willis Homes, a development company with a strong history of ecological stewardship and a desire to preserve what Dr. Odum worked so hard to protect. The Dr. Odum property is today home to Beech Creek Preserve, a conservation neighborhood offering 16 exclusive custom homesites among 15-acres of riverfront greenspace and walking trails along the meanderings of Middle Oconee River.